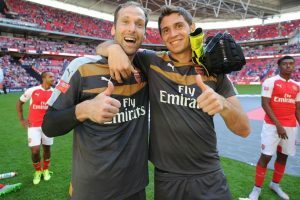 They may be rivals for a place in the Arsenal first team, but the veteran keeper Petr Cech and his young understudy in the Arsenal squad Emilio Martinez seem to get on pretty well if the picture of the two shown below is anything to go by. The 24-year old from Argentina came through the academy system at Arsenal and may well have thought he might never break through into the first team after being sent out on loan to no less than four different clubs, the latest being for the whole of last season with Wolves in the Championship. Despit only playing 15 times for the West Midlands club Martinez clearly did enough to impress Arsene Wenger as the Frenchman has used him in both of our matches in the EFL cup this season and has now rewarded the club’s third choice keeper with a shiny new contract. If that was not enough to put Martinez in a good mood his teammate Cech has weighed in to heap praise on the youngster and the way he has been improving, going on to declare that the Argentinean has all the qualities and talent to make a good career as a Gunner, The Mirror reports. Cech said, “He’s been here for a few years now and I would say that you can see his progress. Having gone on loan a few times and having proved that he has the ability to play at this level – it’s been a learning experience for him as well. “For a player that is not playing as much, he is always ready. I think that he enjoys the game and he is that person you know you can always put him in and rely that he will give you the performance you expect. Martinez could do with all the confidence boosting he can get because not only does he have the brilliant Cech to get past for a place in the first team, he has the excellent Colombian international number one David Ospina and then the even younger Mat Macey to consider, but Cech says that all four Arsenal keepers have a good working relationship despite the strong competition between them. He continued, “As a group we work very closely, we try to help each other and we try to improve every day. “Even me, I can learn from David, I can learn from Emi and they can learn from me. Have Arsenal ever had a stronger pool of keepers?